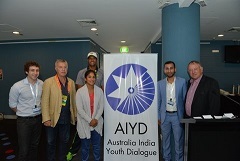 On 26 January, as India commemorated Republic Day and Australians celebrated Australia Day, Cricket Australia hosted 30 young leaders from Australia and India to kick off the Australia India Youth Dialogue 2015. As part of proceedings, the delegates heard from a panel of experts about the role of sport in diplomacy. The panel was comprised of cricketing great Doug Walters, Greg ‘Mo’ Matthews, AIYD Delegate and former vice captain of the Australian Women’s Cricket team Lisa Sthalekar and Gurinder Sandhu, the first male cricketer of Indian ancestry to represent Australia in an international tournament. Following the panel session, delegates were given a tour of the SCG. The AIYD is grateful to Cricket Australia for its ongoing support.